Graham's bag carried the extra load of both our sleeping bags, towels & pillows. I carried my pack (which is a day hike pack) looking like a rag and bone man with an assortment of shoes and sandals, my sun visor and jacket clipped and tied to it. I smile at what we consider "basic and essential" in the food department. Number one thing that goes on all our trips - our big wooden pepper and salt grinders, fresh ground coffee, the plunger, (honestly I couldn't do without coffee), soy milk, rice bran oil, wine for dinners, and Canadian Club rye whisky for a drink before dinner. After all, just because we were going to rough it, doesn't mean we can't be civilized now does it? Our menu plan was - cereal for breaky except for the one morning we were planning to do the Bishop and Clerk hike - then we could have bacon and eggs. Rye vita crackers and Vegemite or Promite for lunch - apples/oranges, cookies, nuts and Granola bars (muesli bars for you Australians) - dinners were burgers, steak (we took steak and veggies and invited the ranger on the island for dinner) spaghetti, snags & a lamb chop and veggies. And our water bottles. We did very well in gauging what we needed as we didn't have much left over for a change. What little was left over, we asked the Rangers if they wanted so we left it for them to share out amongst themselves. Living on the island for 10 days on 4 days off - they were happy to add to their meal stores. We arrived at Triabunna after picking up our perishable groceries - ready to board with ferry with our packs and cooler (Esky in Australian). I was impressed we traveled so light. We wandered the town waiting for the ferry and soon enough the crowds arrived. Yikes a Scout pack! 17 bikes were loaded onto the roof of the ferry - the Scouts had a kitchen set up in a box that was the size and shape of a coffin and weighed a tonne. The ferry men loaded box after box of supplies, tents, sleeping bags, back packs, water bottles, etc etc etc for not only the scouts but heaps of other tourists as well. Thank goodness we were sleeping in the parks workshop accommodation. Not flash - but not a tent. The ferry captain was great with the kids, he had them counting jelly fish to keep them amused. - (huge jelly fish some as large as 3 feet across not normally here said one of the parks fellows who's been doing marine patrols for 3 years) and even let them steer on the way over. The kids were hugely thrilled and we were snapping pictures of them with their camera's for their memory books. When we docked - the head Ranger leapt onto the boat - came through the cabin right to Graham, shook his hand and welcomed him to the Island - telling him there was a vehicle on the wharf for us and he'd see us later. How nice was that! No carrying for me! Woo Hoo. (Oh the other things I could have brought....) When the ferry unloaded and the crowds had dispersed, we loaded our little Suzuki and slowly rattled our way along the track to our temporary home. Although it wasn't deluxe - compared to being in a tent it was 5 star. It had 2 bedrooms with 3 bunk beds in each - a shower and toilet in the building, a small kitchen and living/dining room with fireplace, electricity a fridge and mosquito screened windows. I think that was the best part. Oh the Luxury!! It is at one end of the workshop, and close to the other maintenance and outer buildings which house things like artifacts, fuel, the huge solar panel array with generator (we noticed the generator when it started up as it got dark, but it wasn't on all the time.) The whole feeling of the island is so relaxed, it's a don't lock the doors atmosphere. We unpacked and wandered around the 'precinct' area, meeting some of the tourists and stopping for a chat. Soon enough Marty came back for a brief hello and organised for Graham to come over to the Rangers Hut around 9 the next morning. It was lovely and peaceful so after we unpacked we had a wander. The atmosphere around the camp ground and precinct area was holiday mode; excited children squealing in delight running around the grassy fields - camping noises like dishes being carted to the communal kitchen in pillow cases, people chatting as they came back to their tents squeaky clean after their evening showers. That magical time of twilight, where it's almost time to light a lamp. We strolled along the roads just out of the precinct area - now amongst the Forrester and big Grey Kangaroos, Bennetts Wallabies, Potoroos, Cape Barron Geese (one with a goofy genetic defect that had both wing tips pointing out sideways so it looked like it has holding it's wings out for balance) and... Wombats!!! Lots of big scruffy wombats! Their fur reminded me of when you see a buffalo in winter when there's that little extra woolly fur on top of the normal - so they looked like little woolly/furry bulldozers or hippos in the fields. They weren't too worried about us and Graham was able to sneak up to within a meter of them. It was good fun. We relaxed back at home over snags & lamb chops and got ready for an early night. It was like being in camp. We picked our bunk beds - set ourselves up, happy, pooped and wanting to be ready for the adventures tomorrow would bring. Lights out - we were lulled to sleep with the sweet noise of nature. Morning saw us up and raring to go, already having a coffee when Marty drove up to the workshop to see us. We made another pot and and enjoyed a social chat with him before we followed him back to the Ranger station. (only a short 5 minute walk away) We met the rest of the Rangers and Graham discussed his mission for the day. My illusions of spending 4 days on the beach with a book went out the window as I never want to take a chance on missing an adventure - so I spent this day with Graham making notes for him while he took photos of signs. We made our way to the reservoir circuit which was closed to the public due to the recent flood (which saw 7 inches of rain fall within 1 hour) but as Graham had Park's business to complete ...we stepped over the orange webbing and off we went. Feeling rather devilish I might add.) Along our walk, we nibbled on native cherries (lovely and sweet) and saw a convict built damn, newly exposed by the recent flood. It was serene and beautiful. Back at the ranger station we met the visiting finance lady Meredith, took her back to our place for lunch then we three took the the Painted Cliffs walk. Sand stone cliffs which have eroded into beautiful striped designs. Very interesting tidal pools filled with an assortment of plant and sea life. Each one different than the last - and a wonderful place to explore. 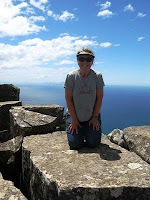 Back at the Rangers hut - we met up with Head Ranger Marty and all jumped into the truck for a trip down to the south part of the island to the Isthmus, Riedle Bay and Encampment bay. This was quite a treat as we went to places that are at least a 5 hour walk away. The scenery was absolutely fabulous. Secluded white sandy beaches with that wonderful turquoise water. They were gorgeous and rivaled some of the most beautiful beaches we've seen in our travels. We saw stunning cliff formations, lovely meadows nestled amongst forests. There were different types of trees in the forests depending on where you were on the island as well. All very solitary, begging for people to plop down and relax. Ranger Marty was a great guide going off road to point out special spots of interest and giving us the history of the island. A rangers job is quite social, so we stopped to have a quick word with everyone we passed. There was quite a variety of people hiking on the island. They are unaccustomed to vehicles as the only ones on the island are used by the rangers so we drove slowly as it was not uncommon to see someone sitting in the middle of the road as we rounded a corner. What kind of person comes to Maria Island you may ask? Well, we met people who were there with walking clubs, families, the scout troupe, international travelers in groups, pairs and on their own, Australian couples and quite a lot of retired folks were in the mix. (Often well over 70 and they all looked more fit than me!!). Everyone we stopped to talk to was in a cheery mood, and believe me, we stopped a lot. There were day walkers, and folks burdened with giant back packs with tents and pots tied on like ornaments on a Christmas tree, also cyclists equally heavy laden. 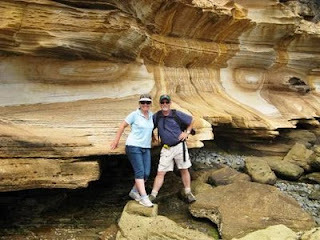 We raced back to take Meredith to the ferry for 5: pm and Marty dropped us at the turn off for the Fossil cliffs walk. We wandered along the cliff edge, dropping down to the sea shelf marveling at the amazing numbers of oysters, mussel's and other shell fossils captured in the cliff for thousands of years now there for all to see. There were huge sheets of cliff face that have fallen over the years each of them peppered with these fossils. We wandered along soon coming to the air strip - a mowed grassy field and stopped to watch a small plane race by us to take off. Believe me, I was ever mindful of snakes that could be lurking in the long grass and was happily ready to thump Graham as he walked in front of me and periodically leap up calling snake turning to watch with glee as I tried to levitate. We wandered through the artifacts at the Convict Barn enjoyed the coolness of the air, and carried on home. Back to the workshop and time for a drink before our burger dinner. Then another wander and frankly after the 20 kilometres of walking for the day - I was pooped!! I've smeared so many layers of sun screen on today I feel like I was wearing a balaclava - and I've still managed to get wind burnt. After dinner we wandered down to the Jetty ready to settle in and wait for the Penguins to come in from the Ocean. The winds turned cold and storm clouds were churning so we quick stepped back home leaving this treat for tomorrow. 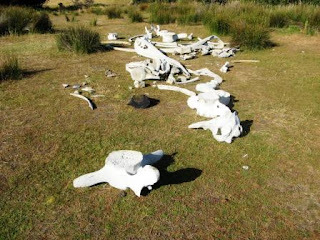 Friday we wandered the main town area photographing and measuring - saw a big display of whale bones they have laying on the lawn in the camping area by the BBQ site. That was very interesting and fabulous as the bones are just out there for kids and adults to handle and the discovery Ranger gives a talk about them once a week. We did another run down South for Graham to measure up signs we had seen yesterday, then were allowed to join them on their Marine patrol (lucky we have our restricted coxswains licenses) - just as we left they were asked by the local water Police to assist in their search for the body of a fellow who had fallen off a wharf earlier in the week. We were given our section to search and completed this sobering task. During our search, we all scanned the rocks on the water's edge, around and under wharfs, and passed a fish pellet factory which emitted the most rank smell ever! We were unsuccessful in finding a trace of this lost soul, and turned our boat back to Maria Island, thankful to be able to enjoy the rest of a lovely day on the water. We were delighted to have a brief encounter with dolphins who gracefully dove through our wake then carried on their own way happy in their own adventure. When we got back, the Park's big boss had arrived with his family for the day - so after a quick hello with him, we left the rangers to their business, and had time to tidy up and get ready to go to Head Ranger Marty's for a BBQ. We brought steaks, potatoes and wine and he made a Greek Salad and generously shared his chocolate stores with us for desert. After dinner he gave us the insider's "behind the locked doors" tour of the precinct as he locked up the displays buildings for the day. Then we carried on to the waterfront to watch the penguins come ashore as night fell. Saturday - Graham went off to collect GPS fixes for the signs and I wandered around with pad and pen writing for the first time in ages. The weather was very unsettled, windy with clouds rolling through - dull - and I felt even the people on the island could feel the change. I sat for a time at the painted cliffs, wandered the trail to the Oast house - and went down to the Jetty for several hours. This was spaghetti night - and we joined Discovery Ranger Fiona for her wildlife night walk after dinner. Sunday we rose at 5:45 am (what? on my last day of holiday you might ask??) but we had a personally guided bird spotting walk arranged with Ranger Fiona. She supplied us with binoculars and off we went looking for the very rare 40 spotted pardalote bird which only lives amongst the white gums in a few spots in Tasmania. I personally didn't see any but we did hear their call and are now ready to keep our ears alert where ever we go so we can report back where we find any! It was a lovely start to the day. Graham finished off a few things and we packed up and decided we'd try to go as far as we could up the Bishop and Clerk walk. This is a 12 kilometre walk up 620 meters from sea level. We had a snack packet of crackers with dip, an apple and Granola bar each and one 500 ml bottle of water to share and 3 hours before Graham was due back to meet with the head ranger. We walked quite briskly across the grassy hills to the fossil cliffs where the beginning of the Bishop and Clerk hike begins, we followed the cliffs up until the path entered a shady forest (I felt like I could have been back in British Columbia) up a steady inc line we continued until we reached the shale rocky part which seemed to go straight up to heaven! Poor Graham couldn't hear much over my heavy breathing but we marched along - the rocks have settled into a path and it appears someone has moved the rocks into steps that wind their way up this very steep face! Soon we were past the shale rocks and into the boulder area, using hands as well. We got to almost the top when we came to a very large rock - I wasn't sure I could climb this one and didn't want to risk injury at this great height - so I convinced Graham I was happy to sit and munch on my apple while he investigated the very top. He came back animated about the view, and confident I could do it - as I felt somewhat recovered I decided I could give it a try when another couple appeared - took our photo - and continued on. Hmmm, she didn't look too much more fit or coordinated t han me, and I was almost there... what the heck - I had to go to the top. So I did - got the others to take my photo and then scrambled back down to greet Graham very pleased I had made the effort. We quick stepped back to the rangers hut having completed the walk in 4 hours exactly including the 35 mins we spent on the top! Well done us!! That left us just enough time to say good bye to the rangers who now felt like good friends, and head back to the mainland. Wearing our sweaty stained shorts with pride as did the rest of the return passengers all talking about their hiking accomplishments. We had a terrific pizza for dinner in Orford at "Scorchers" and carried on home. What a long and full day as we arrived home around 8:30. 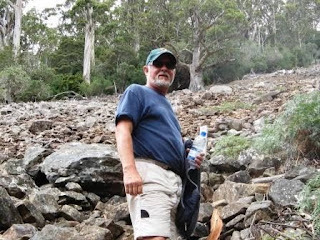 Graham's work trip - what a fabulous adventure and I was so pleased he shared it with me! !